Evening Class | What is the Architect’s Role in the Housing ‘Crisis’? What is the Architect’s Role in the Housing ‘Crisis’? It’s time to “…re-position the architect as an active, politicised contributor to this ‘crisis’”. 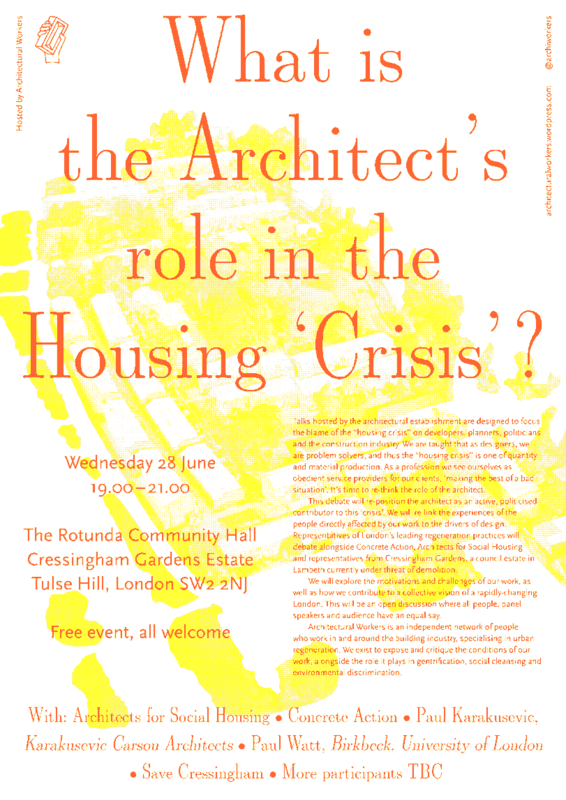 We were approached by the group Architectural Workers to design posters for their first event "What is the Architect's Role in the Housing ‘Crisis’?". This is the first in what will be on ongoing collaboration and discourse between our two groups. 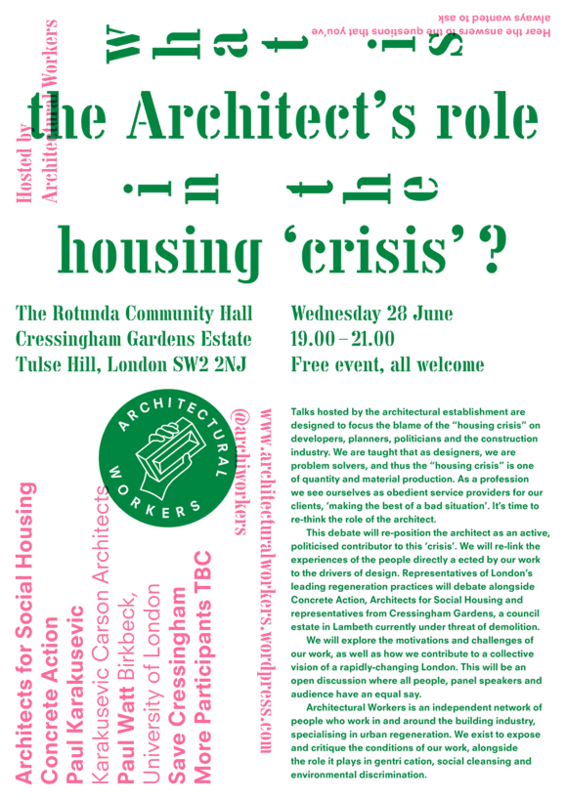 Talks hosted by the architectural establishment are designed to focus the blame of the “housing crisis” on developers, planners, politicians and the construction industry. We are taught that as designers, we are problem solvers, and thus the “housing crisis” is one of quantity and material production. As a profession we see ourselves as obedient service providers for our clients, ‘making the best of a bad situation’. It’s time to re-think the role of the architect. 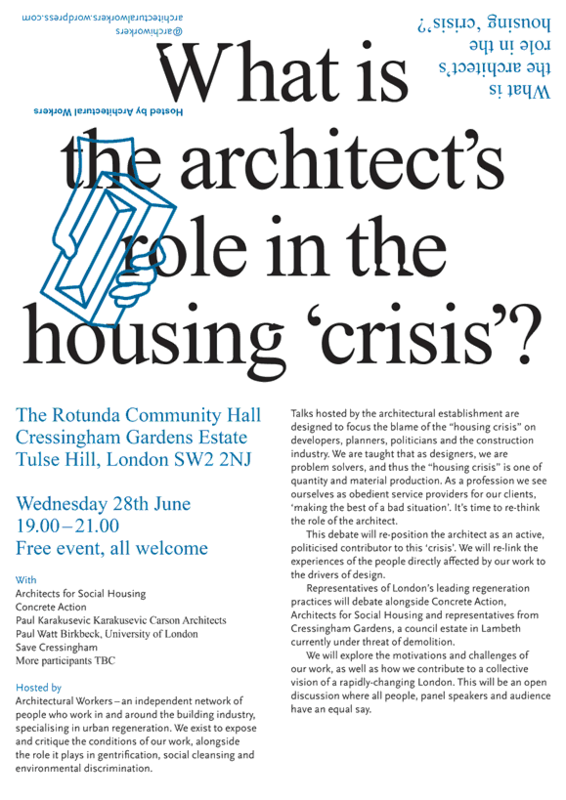 This debate will re-position the architect as an active, politicised contributor to this ‘crisis’. We will re-link the experiences of the people directly affected by our work to the drivers of design. 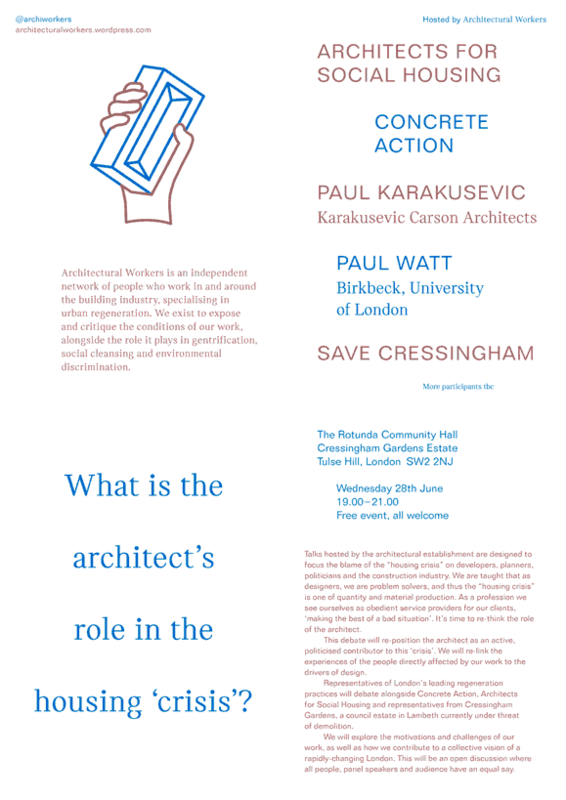 Representatives of London’s leading regeneration practices will debate alongside Concrete Action, Architects for Social Housing and representatives from Cressingham Gardens, a council estate in South East London currently under threat of demolition. Will will explore the motivations and challenges of our work, as well as how we contribute to a collective vision of a rapidly-changing London. This will be an open discussion where all people, panel speakers and audience have an equal say.